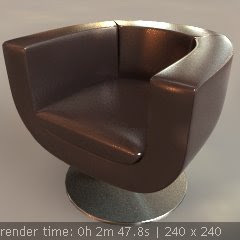 Earilier I wrote about vray dmc glossy samples, so I figured I would do one with mental ray glossy samples as well. This chart for mental ray takes the combination of samples per pixel vs. A&D material glossy samples. You decide which one is best for the amount of rendering time. I also found it interesting to compare with the v-ray test and see what overall gave the best performance results. Here's the max file (max 2008, mental ray) if you're interested in the rest of the settings. I was using an hdr map, so you will notice a broken link to that map. Use a reflect/gloss combo that works well, however be sure to check 'Fast (interpolate), select 1/4 res, and 'neighboouring points to look up: set to 4. Also, set the glossy samples to around 32. This gets rid of the 'wet' look that I usually get without the fast interpolation.